A daredevil 72-year-old grandfather of six became the first person to sample the longest zip wire in the northern hemisphere. 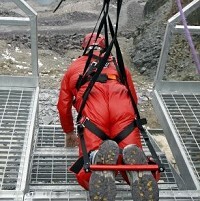 Robert Davies rode the mile-long, 700ft-high line over a mountain lake at the new Zip World Snowdonia attraction in Penrhyn Quarry, Bethesda, North Wales. Asked to describe his experience, the septuagenarian said it was "one of the most amazing things I've ever done". And Mr Davies is definitely not alone. His achievement will strike a chord with adventurous older people who enjoy adventure holidays overseas. While an all-action vacation can be the perfect way to stay alert in retirement, travellers must remember to arrange seniors travel insurance before they leave to cover them in the event of an emergency. "I was a bit apprehensive when I got up there but not scared," Mr Davies, a former construction worker, said. "It really is an amazing view and when you are flying through the air at 95mph it is a fantastic feeling. I would absolutely recommend it as it is something different. You could hear me screaming the whole way down!"